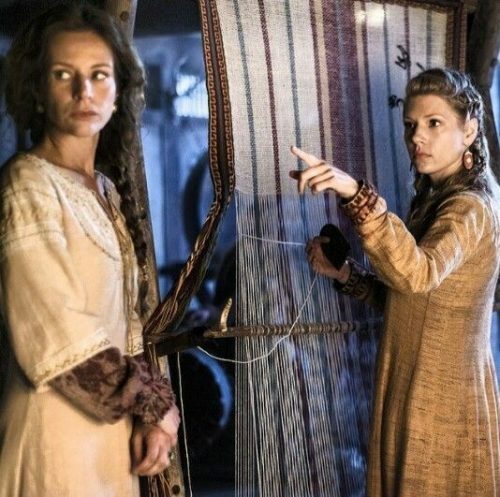 Siggy and Laergatha (personal role model) get down to a spot of light weaving before commencing to crush skulls and pillage. Here in the 21st century, Lorna and I use hand looms because powered looms are very expensive. They’re also usually pretty enormous, being meant for enterprise rather than home use. This is pesky, because there’s a lot of repetitive action involved, which can be hell on the carpal tunnels; weaving can be slow, tough work. The general sequence of events for running my Raspberry Pi controlled loom. The project was really a proof of concept idea rather than an actual production model. This video is intended to supplement my blog at www.photographic-perspectives.com Sorry, there is not audio with this. Fred wrote about the project on his website, explaining that he came up with the idea for very personal reasons. His wife Gina has been a weaver for 30 years, but she began to experience difficulties with the physical aspects of using her loom as she grew older. Conversations with other unwillingly retired weavers told Fred that Gina’s situation was not uncommon, and led him to design something to help. His device is intended to help older weavers who have trouble with the hard work of throwing the shuttle and holding down the pedals. 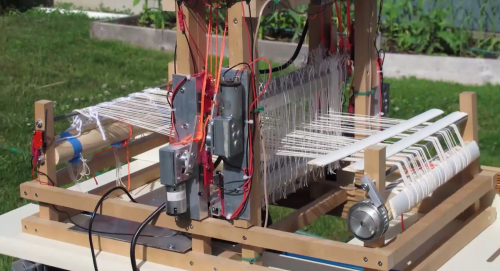 Assistive looms cost upwards of $10,000: Fred’s solution comes in at a tidy $150, factoring in loom, Pi, and some motors from Amazon. So this isn’t for hobbyists like me: this loom can be a way for people whose livelihoods depend on being able to weave to continue working long after they might have had to retire. One of the most satisfying things about the Raspberry Pi for me is its power to drive cost out of devices like this, and to change the way we work. This is a simple build, but it has so much potential to keep someone’s income flowing: we hope to see more as Fred develops the project. That one from _Viking_ is a “warp weighted loom”, and–yes–it is correct for time and period. One of the things I love about the show is the attention to detail given to the textiles and the broader costuming. I spend far too much time pausing it and internally debating contemporary construction and materials. Everybody: Hal makes his own chain mail. We’ve got a project showcase article on this in issue 52 of The MagPi, due out soon. Wow, I’m impressed. Many years back, I became acquainted with the finer points of looms through a girlfriend who was into weaving. Help put together her “some assembly required” 8-harness floor-standing loom. They are ingenious machines with a lot of fiddly details. I thought, reading this article surely the $150 must be for the Pi and driver hardware, to attach to an already-built loom. Had to go check the linked blog post. I’m impressed with what he’s done. Lovely. We used to have eight Vamatex Leonardo looms (like these https://www.google.co.uk/url?sa=t&rct=j&q=&esrc=s&source=web&cd=3&cad=rja&uact=8&ved=0ahUKEwiFyuqe6bDQAhUhOsAKHaTpCrcQuAIIJTAC&url=https%3A%2F%2Fwww.youtube.com%2Fwatch%3Fv%3DxY_QoHsq7yc&usg=AFQjCNFylYTpc_R2KEsgXA0w2DkAqX4Cwg&sig2=-2kl5eEseBztYEGJ4fRAMA) It was satisfying to watch the fabric literally roll off them at 500 picks/minute. Excellent project to demonstrate STEM. It has mechanics, motors, sensors and Raspberry Pi as a controller. It would be great if a system schematic is incorporated. This could show the connections of the Pi, motors, switches and the mechanical structure. Maybe I missed something, but I didn’t see why this project would require a Pi over an Arduino. Is there a reason or was it just for fun? There is no specific reason why the Pi is required over Arduino, as it is being used primarily as a controller, not a processor. This does allow for easier functional expand-ability with simply creating a new program per function, where as an Arduino requires expanding the same code program to include the function, and call out to it. Yes, forget Raspbian and install Slackware ARM. Forget messing about with unconventional Linux methods that teach you how NOT to use a Linux system and embrace Slackware, which is still the most UNIX-like operating system out there and one of the most stable/reliable/secure systems there is!